Max von Laue was a German physicist who won the 1914 Nobel Prize in physics for his discovery of X-ray crystallography, which helps in determining the arrangement of atoms in some substances. Born in Pfaffendorf, Sachsen, Germany on 9 October in 1879, Max von Laue studied physics at the University of Strasbourg, and later, the Universities of Göttingen and Munich. 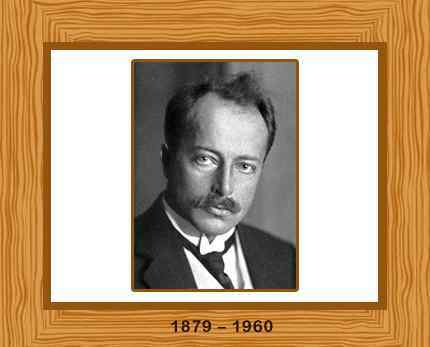 He received his Ph.D. in physics from the University of Berlin in 1903. Max von Laue worked as an assistant to his mentor, Max Planck, at the Institute for Physics in Berlin. He was appointed the deputy director to Albert Einstein at the Institute for Physics in 1917. Laue’s initial interests were in optics and the wave theory of light. When Wilhelm Röntgen discovered X-rays in 1895, scientists were not sure if they were particles or short electromagnetic waves. Laue predicted in 1912 that X-rays could be diffracted by a crystal acting as a natural diffraction grating. Later experiments with several crystals produced patterns, which were termed as Laue patterns, from which crystal structure could be interpreted. Einstein praised Laue’s work as one of the most beautiful discoveries in physics. His contributions gave birth to X-ray spectroscopy, the exploration of atomic structures of chemical elements and the determination of X-ray wavelength. X-ray structural analysis played a vital role in modern physics and chemistry, with practical applications in various industries. In his later years, Max von Laue worked on the forces between atoms and also studied the thermodynamics of superconductivity. He wrote several famous books on the history of physics and Einstein’s theory of relativity. During World War II, Laue was arrested by the Allies forces and, like other German scientists, was sent to England. He came back to Germany in 1946 and took charge of the Max Planck Institute, Göttingen. He was appointed the director of the Fritz Haber Institute, Berlin in 1951, when he was 71 years old. Laue retired seven years later in 1958. Max von Laue died on April 24, 1960. He was 80 years old.